If you have any questions about the MIDLANDIA information page below please contact us. The motor yacht MIDLANDIA is a 52 metre 171 (ft) impressive steel boat which was newly built at Benetti Yachts and designed in the office of Fratelli Benetti and Stefano Natucci. Sleeping 12 passengers and 13 qualified crew, motor yacht MIDLANDIA was named Alfa Iii. The naval architect whom authored the drawings in respect of the yacht is Fratelli Benetti and Stefano Natucci. Also, the interior styling was created by Zuretti Interior Design. Fratelli Benetti was the naval architect involved in the technical superyacht design work for MIDLANDIA. Her interior design was conceived by Zuretti Interior Design. Fratelli Benetti and Stefano Natucci is also associated with the yacht general design work for this yacht. Created by Benetti Yachts this vessel was built in Italy. She was officially launched in Viareggio in 2001 before being transferred to the owner. A spacious feeling is brought about with a maximum beam (width) of 9.4 m / 30.8 feet. With a 3.4m (11.2ft) draught (maximum depth) she is deep. The material steel was used in the building of the hull of the motor yacht. Her superstructure above deck is created out of aluminium. In 2006 further refit work and updating was in addition performed. Powered by two CATERPILLAR diesel main engines, MIDLANDIA will attain a top speed of 16 knots. Connected to her Caterpillar engine(s) are twin screw propellers. She also has an economical range of 7000 nautical miles when underway at her cruise speed of 15 knots. Her total HP is 3150 HP and her total Kilowatts are 2350. With respect to bow thrusters she was fitted with Vosper. With respect to the ship’s stabalisers she was built with Vosper. 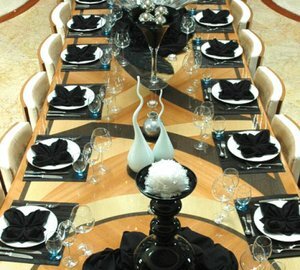 The impressive luxury yacht M/Y MIDLANDIA can accommodate as many as 12 passengers and has 13 crew members. During October 2009 MIDLANDIA cruised to Montauk, in United States. This motor yacht also traveled the area encompassing Suffolk County during the month of October 2009. As she was designed to have a landing area for helicopters aboard, MIDLANDIA is able to transfer guests and/or equipment over to a different landing site. The yacht uses Airco air conditioning. MIDLANDIA features a teak deck. 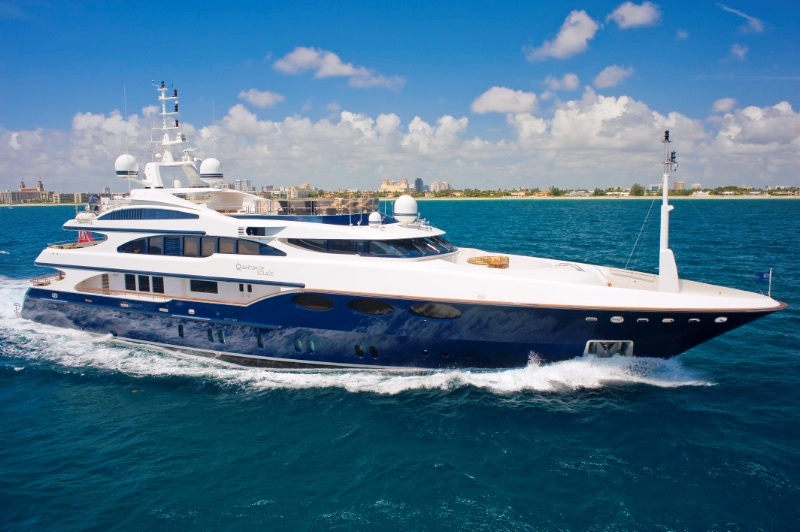 The luxury yacht MIDLANDIA displayed on this page is merely informational and she is not necessarily available for yacht charter or for sale, nor is she represented or marketed in anyway by CharterWorld. This web page and the superyacht information contained herein is not contractual. All yacht specifications and informations are displayed in good faith but CharterWorld does not warrant or assume any legal liability or responsibility for the current accuracy, completeness, validity, or usefulness of any superyacht information and/or images displayed. All boat information is subject to change without prior notice and may not be current.